There is a number of possible revenue streams for Webmasters, offered by Reverse Auction Factory: Commissions (seller or bidder can be charged), Pay per Listing, Pay per Bid, Pay for Contact, Pay for featured auctions. 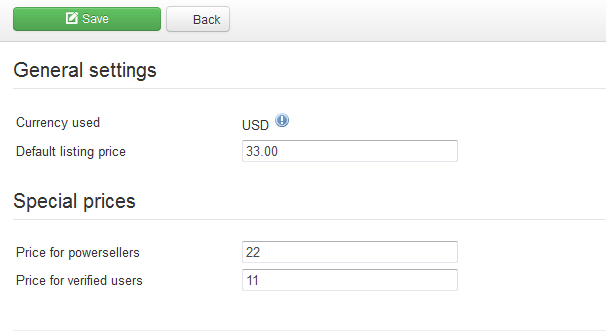 You also have several Payment Gateways shipped with the standard version. 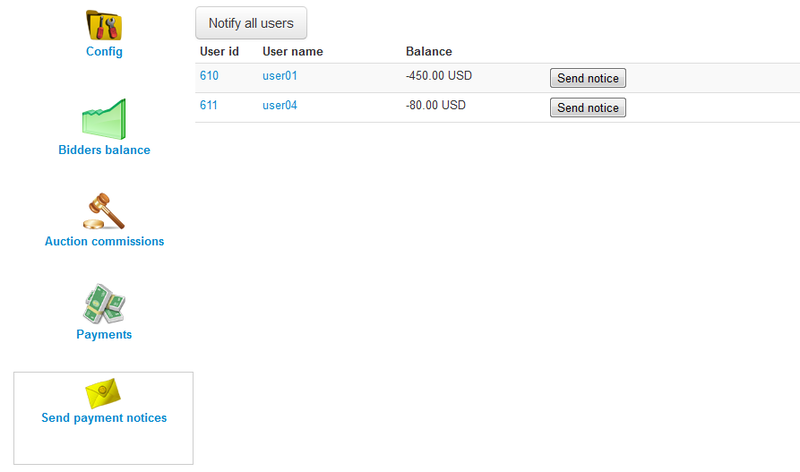 There are two "payment types" used in the auctioning platform. One is between the Bidder and the Auctioneer, which is not handled by the extension. Reverse Auction Factory only provides the users with ways to contact each other and even a PayPal link which passes the payment details onto the payment processor. The auctioneer must have a Paypal address saved in his profile, as the payment must have a destination. 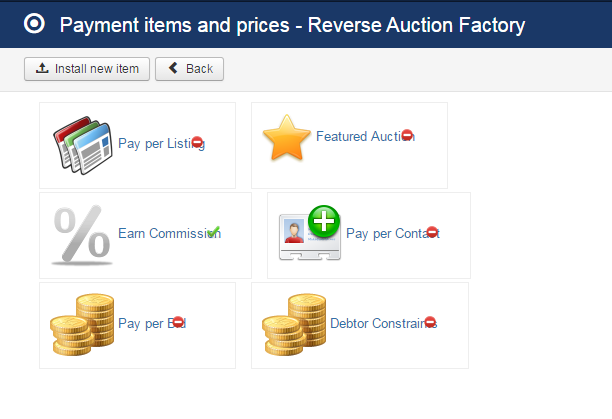 Reverse Auction Factory comes, by default, with multiple Payment Gateways, which can be used to pay for the Payment Items. To enable or disable the items click on the symbols in the upper right corner of each item. A pop-up should appear with "Click to disable" or "Click to enable" when hovering the icon. Pay per Listing - Users pay to publish auctions. Debtors Constraints - Blocks certain tasks for users that have a negative balance. The Pay per Listings item will allow you to request a defined price for every newly posted auction. In case the respective user doesn't have the required amount in his balance, the auction will be set as Unpublished and a payment of that value will be added (on pending), with the user being redirected to a payment form for buying the required credit for the auction in question. When the owner is charged and the payment is completed, his auction will become Published and accessible by other users. You can add preferential prices for the special user ranks and also add custom prices for specific categories by checking Enable categories pricing checkbox and add the prices next to their names. Leaving the fields empty means that those categories will have the default price, while adding "0" means the respective categories are free. When promoting your auction to Featured, the amount of credit needed for finalizing the payment will be "consumed" from your balance. If you don't have enough credits, you will be redirected to a payment form for buying the required credit for finalizing the auction in question. When the user part of the payment is done, PayPal will send an IPN notification to the site with the payment information and status. The IPN will arrive if the payment is valid, directly accepted if the buyer's Paypal account is trusted or manually accepted. In the latter case, the payment must be approved by the webmaster and only after this, the credit will be available to the buyer's account. The Featured Auction item adds auctions on top of the lists and with different, more visible templating, regardless of sorting. Amongst featured auctions, the regular sorting applies. For this item, you can set the default listing price that users will have to pay when they promote their listing to the featured list and also to set preferential prices for the special user ranks. (!) The Currency Used can be set from Settings/Currency Manager. However, it is very important to have the payment item enabled when switching to another currency. If the item is disabled, the currency used will remain unchanged. Note that a module displaying these auctions is also available from the Module Manager, allowing you to enable and configure it. Earn Commission, if enabled, will allow you to earn a defined percent as a requested fee based on the winning bid, taxing the buyers or the auctioneers in the process(according to the workflow setting). In case the auctioneer has to pay the commission and he has insufficient funds in his balance, he will be redirected to the payment form for buying the required credit. In case the winner has to pay he will get a pending payment order consisting of the set percent from the amount he won. 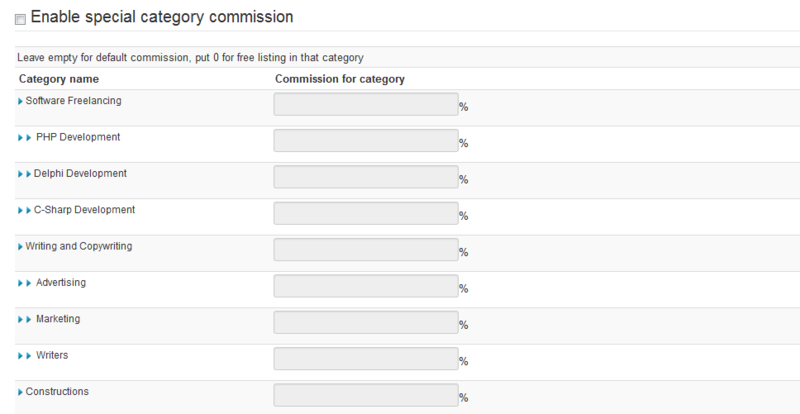 From the backend, you can set the Default Commission percent that buyers or sellers will be charged along with setting a special commission for Powersellers and Verified Users. Besides this, in the Config area, you can view the email notification message sent to users when they have a commission due, with the option to edit it using a WYSIWYG editor. You can add custom commissions for different categories available for listings or only specified categories to be commissioned by checking the Enable special category commission checkbox and adding the values to the fields found there. Leave empty for default commission or put 0 for no commission in that category. On the left side you will find various pages with lists where you can verify, for instance, the Bidders Balance, which displays all the users that currently have a negative or positive balance, when their last payment was finalised, an Auction commissions page where the auctions that gained you funds via commission will be displayed, and a Payments page which provides a list of all the payments made, including the ones for commissions. Contact buying is the same as for every credit buying: in case you don't have the required amount of funds in balance, you will be redirected to the buying form, where you choose to buy credits to view the hidden profile info. Contact info is bought when the user is charged and the payment is completed, as for every payment pricing. This feature is not available in CB because Community Builder displays, by itself, the profile of a user and only setting up restrictions of privacy directly in CB can prevent hiding the user details in case of an active CB. 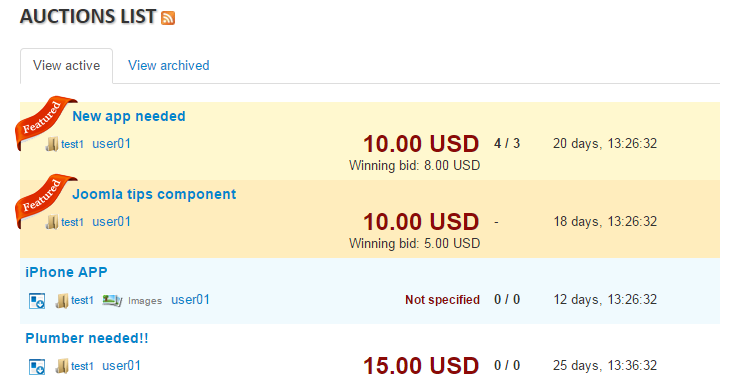 With the Pay per Bid feature enabled, users will have to pay a certain amount when they place new bids. The system is the same, like for other items: if the user has funds in his account, the bidding will be done instantly and the account charged. If the bidding user has insufficient funds, he will be sent to the checkout page, in order to pay the respective amount before the bid is placed by the system. When a user with negative balance tries to do one of these restricted tasks he will get notified about his negative balance and will be redirected to the add funds page. As settings for this feature, you will find the Days threshold field, which represents the number of days users are allowed to have negative balance before the restrictions will be applied.